Fun and unique way of telling the life of President Theodore Roosevelt. 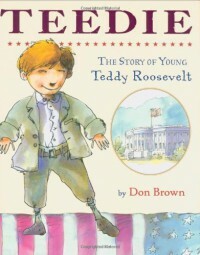 As it mentions in the title, it spends a lot of time focuses on the youth of Teddy, and I think a lot of kids will find this part of his life interesting. It has great pictures, and a fun way of displaying the text.